MASHPEE, MA .....a great place to live! It’s a superb mash-up when sandy beaches, freshwater ponds, and enchanting woodlands coexist with superior shopping and classic New England architecture all in one little town—and on Cape Cod, no less. 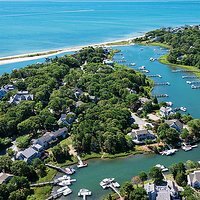 Set along the south shore of the Upper Cape and home to 14,154 people, Mashpee manages all of these riches with considerable charm, perhaps nowhere more so than its groundbreaking mixed-use development of Mashpee Commons. What began as a transformation of a 1960s suburban shopping strip into a compact New England town center, Mashpee Commons now has a mix of residential options along its sidewalk-lined streets and green spaces, and is home to a cinema, library, pharmacy, bowling alley, and new bandstand with free concerts and films. New Seabury adds a master-planned community into the town mix with luxe waterfront homes (plus two championship golf courses), and with thousands of acres in the Mashpee National Wildlife Refuge, Mashpee is a newly rising New England classic.